The 105 Series is a high quality UHF camera-mount wireless system that features 92 User-Selectable frequencies to assure you of always finding a "free" channel. 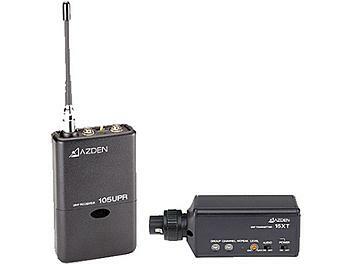 The series consists of the 105UPR On-Camera receiver, the 15BT Belt-Pack transmitter, the 15HT Handheld microphone/transmitter and the 15XT Plug-In transmitter. The 105 System comes with the 15XT and the 105UPR.